After leaving Reao Atoll, we sailed four nights en route to Fatu Hiva, the southernmost island of the Marquesas’ archipelago. As a result of using our bigger sail to keep up speed, we ended up 30nm off course to the west at one point. Nevertheless, it was still a close reach (ie. going slightly “upwind”) meaning that the waves rolled the boat from the side, causing an uncomfortable motion. Ironically, the veteran sailors on board (Spence, Sabrina, and I) were all feeling queasy, while the greenhand (Deena) was doing just fine! She also did fantastic steering by hand. When we are tight on the wind, the autopilot doesn’t work as well, so we hand steered a lot during the first day or two. 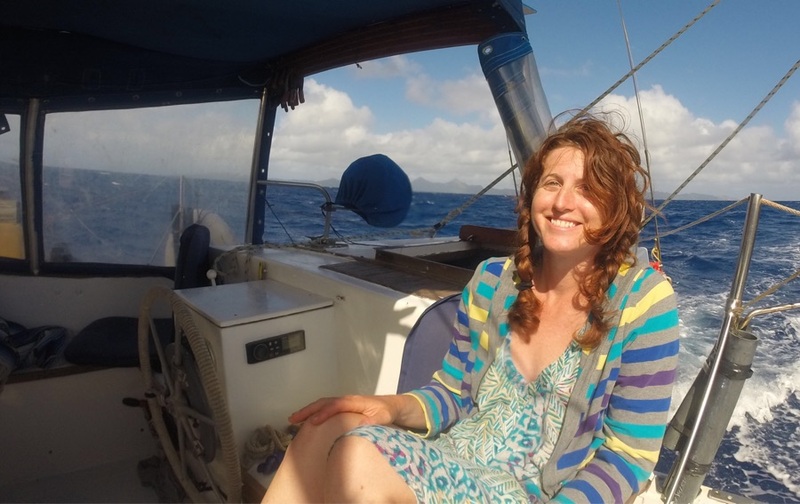 Deena has the best attributes one can have as a crew member on a boat — staying positive and helpful — despite the fantastic blasts of water that bashed the bottom of her bunk, interrupting her sleep. She’s also a super star in the galley, creating many mouth-watering amazing meals under way. This girl proved she can handle some seas! Can we make a one time donation instead of a monthly patron amount? How to do it? Your message comes at a good moment.. During our passage to Marquesas, we just sustained significant damage to the boat (a big bummer!) and could indeed use one time help from our community. The easiest way to make a contribution is thru paypal to greencoconutrun@gmail.com . We’ll share with you what the funds are used for. Many many thanks! Thanks for the info. Will do later today. Hope others will join in so you have enough to fix the damage!